A Hindutva surge that is end angering democracy worried Gauri. Her end highlights the risks serious journalism faces. Gauri Lankesh belonged to a generation of young people who came into journalism in the 1980s when the press, mostly under a new crop of editors, was celebrating its freedom re-won after the Emergency that had forced it to go into subservience. She honed her skills, reporting on Karnataka developments for the English-language media. In the fullness of time, as most of her contemporaries settled down comfortably as upholders of the Establishment, Gauri metamorphosed into a restless, doughty anti-Establishment warrior. The transformation of the scribe into an activist came into full view as Gauri switched to Kannada journalism on the death of her father, P. Lankesh, in 2000. He was a multifaceted personality and the founder-editor of the popular weekly Lankesh Patrike, whose conduct as a fighting paper blazed a new trail in Kannada journalism. Without leaving room for advertisers to dictate his agenda, Lankesh carved a niche role for his 1980-founded journal by vigorously championing the cause of the weak and the downtrodden, particularly the Dalits, peasants and women. Gauri carried forward the tradition with fresh vigour. Under her, the Lankesh brand acquired a new life. Five years later, she floated a new journal, appropriately styled as Gauri Lankesh Patrike. Human rights issues were a major concern of hers and they started claiming much of Gauri’s energy and time. All the same, there was no weakening of her commitment to investigative journalism. She reportedly assured friends that she would continue to publish exposes as that was what a journalist was meant to do. Gauri made all causes that she considered just and legitimate and brought to bear a deep sense of commitment to them. She began reaching out beyond Karnataka, and identified herself, in the immediate past, with the struggles of the students of Delhi’s Jawaharlal Nehru University, the Dalits of Gujarat and the youths of Kashmir. Agitations became a part of Gauri’s life and agitators became even members of her extended family. She was an agitator with a problem-solving mind. At one stage, Gauri bent her energies towards dissuading the Maoists and the predatory state from continuing along the path of violence. Her efforts led to a few persons giving up arms and resettling to lead peaceful lives. The rise of Hindutva worried Gauri. For, she saw it as a grave danger to India’s fragile democracy and a severe threat to its age-old secular fabric. As lawless elements enjoying the patronage of the Hindutva establishment unleas­hed terror across the country, hers was one of the loudest voices against it. Gauri carried forward a tradition set by her late father, whose Patrike championed the cause of the downtrodden. 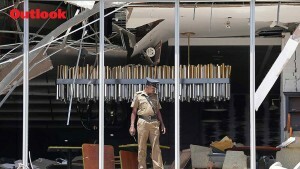 Gauri was disturbed by Karnataka dev­elopments that indicated attempts to convert the state into the Gujarat of the South. When the state was under President’s rule in November 2007 after a spell under a Bharatiya Janata Party-Janata Dal (Secular) coalition, she cited specific instances to show that much of the media had been saffronised. The varsities were being coerced to accept Sangh Parivar’s demands, she alleged, adding that Muslims, Dalits and backward classes were coming under attack, and the police were playing a partisan role. Late last year, a court found her guilty in a case of defamation filed by two BJP leaders. Gauri was sentenced to six months’ impr­isonment and fined too. She was immediately granted bail, pending appeal, but the BJP’s IT cell allegedly used the conviction to threaten other journalists who did not toe its line. Dwelling on the situation in the state at the time, Gauri said, “In Karnataka today we are living in such times that Modi bhakts and the Hindutva brigade welcome killings, as in the case of Dr M.M. Kalburgi, and celebrate deaths, as in the case of U.R. Ananthamurthy, of those who oppose their ideology, their party and their supreme leader, Narendra Modi.” She added, “They are keen to somehow shut me up too. A jail stint for me would have warmed the cockles of their hearts”. This September 5, they somehow did it. That evening as Gauri returned from work, three armed men intruded into Gauri’s house and shot her at point-blank range, killing her instantly. Gauri certainly was not unaware that she was living a dangerous life. Personal safety was not an issue that bothered her unduly. Individuals or inst­itutions were never her prim­ary concern. She was primarily concerned about the state of her society and polity. 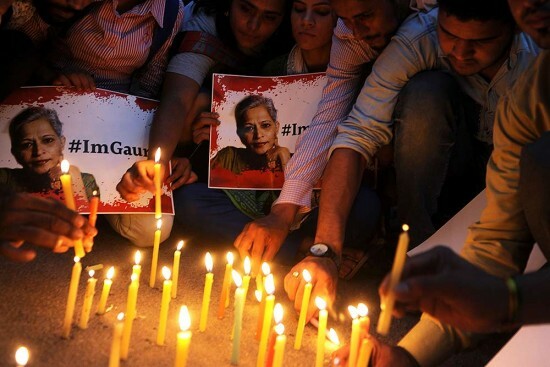 Gauri’s martyrdom momentarily highlighted the risks that serious journalism faces today. September 6 saw a spontan­eous display of solidarity by not only journalists but civil society country-­wide. But the total silence of the only two men who matter in the Establi­sh­ment and the gleeful celebration of her murder by Hindutards (incidentally reminiscent of the distribution of sweets by Hindu communalists after Mahatma Gandhi’s assassination on January 30, 1948) remind us that there is a battle ahead that needs to be fought to make safe our democracy and its institutions, including the media. That is a battle to be fought not in the studios of corporate television but in the citadels of democracy, and perhaps even in the streets where Gandhi had fought his battles. The murder of a top editor triggers fresh alarm bell. It’s heads-up for CM too.